Like many road cyclists, I ride early in the morning to avoid traffic, and to leave the rest of my day free to work or play, so I use lights for a road bike to see and be seen. This means that for several months during the year I leave home in the dark. One thing that constantly amazes me is that I see other cyclists riding around with inadequate or even no lights on their bikes. They are also often decked out in dark clothing on dark bikes. I’m not sure if they are trying to be really ‘cool’ or are just plain stupid. Many cyclists do not realise that it’s actually illegal to ride a bike at night without lights. In the state of NSW where I live, if you ride at night you must have a steady or flashing white light that is clearly visible for at least 200 metres and a flashing or steady red light that is clearly visible for at least 200 metres from the rear of the bike. I also take night to mean 5 am when it’s still quite dark at certain times of the year. I use lights pretty much all the time when I’m riding alone. When it’s dark I use the front light on a steady beam so I can see where I’m going, because even if you are on familiar roads and paths, there can be obstacles like sticks, rubbish and rocks that can be a big hazard. When it gets lighter and I can see where I’m going I change my light to a flashing pattern so that other road users can see me. I always use my rear light on a flashing pattern and I nearly always have it on, except when I’m riding in a group and it’s fully light. If you buy lights for commuting then you need to consider whether it’s more important to be seen or for you to see, or perhaps both. This will dictate whether you want a light that will spread light or be a strong beam in front of you. The most basic lights are powered by alkaline batteries and they work fine for riders who don’t use their bikes on a really regular basis, but if you do significant time on your bike then you’ll be better off with rechargeable lights. Many of these are charged via a USB charger or computer, while some more powerful ones come with a separate battery pack. You also need to consider how the lights mount and where they mount on your bike. Most front lights are designed to fit on your handlebars and come with appropriate mounts that can be adjusted to fit different sized handlebars, but there are also some that fit on helmets. Rear lights can be fitted to seat posts, bags, seat stays, helmets or even your jersey pocket. I’ve seen a few rear lights fall off when a rider hits a bump so it’s important to secure it well. If you’re commuting it’s a good idea to have more than one rear light. When I commute I have a light on the back of my rack, one on my seat stay and another on my helmet. I don’t care if it’s a bit uncool, I’d rather be seen by other road users. The old adage “you get what you pay for” is very true when it comes to bike lighting. More expensive lighting will work better, last longer and will probably come with a generous warranty. Plus, it will light your way and keep you safe. What more could you want. 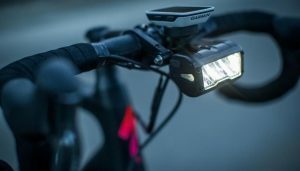 You’ll find most bike retailers have a good range of bike lights and give you good advice about what will meet your requirements. To me, as well as being illegal, it’s just plain stupid to not have good lights on a bike. What are your favourite lights for a road bike to see and be seen? Share via comments or the Women Who Cycle Facebook page.